Machboos is really a dish that surprises. And as you eat clean on the plate, licks his fingers and wonder if there’s more. It comes from the United Arab Emirates. The first time I ate it, was in Cairo (Egypt’s capital and Africa’s largest city) at a restaurant that specialized in food away from the Emirates. Loved it so much, that the next time I was in Cairo, went to the same restaurant. I tend to do it often. It fits right now is very good because it has very little flavor of Christmas. Wonderfully spiced without being too much of anything. Boil water with bay leaves, cumin, pepper, salt, mace, onions, turmeric, cloves, cardamom seeds, stock cube and 1 sliced ​​onion. Add the meat and let it get to cook until it is tender, about 30-60 minutes. Then fry the meat golden brown. Turn the rice in a pan and pour over the broth from the meat and add any more water if needed and salt. Add the saffron and raisins. Let cook until it is almost done. Add the rose water and let the rice will absorb it. Fry the onions, chickpeas and almonds golden brown. Add the rice first. 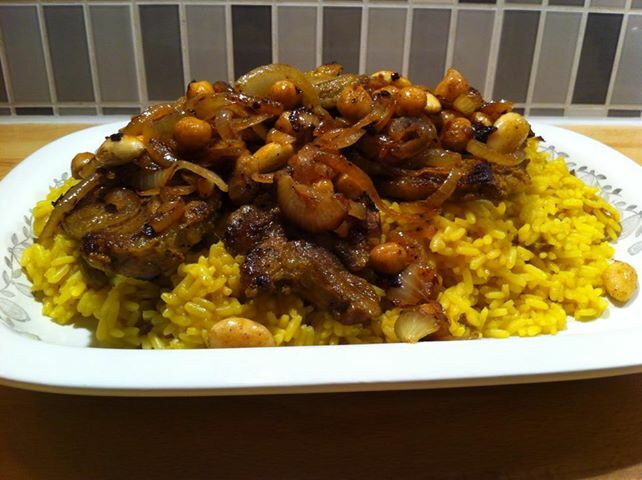 Add the meat and finally the onions, almonds and chickpeas. Serve immediately. Most delicious dish!! I believe cardamon makes all the difference in all Arabic world cuisine! Don’t feel sorry for it; use as much as you stand in your mouth.. it can only get better! Hi This photo is my private one and is a copyrighted as well. If you want to use it, I need to know more about it.